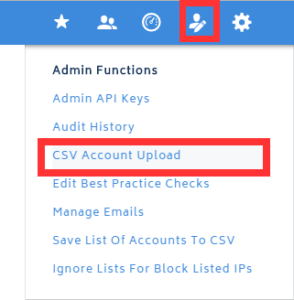 The CSV Account Upload feature allows users to import multiple accounts and credentials in bulk to make account creation easier, faster, and reduce the potential for error that may occur when accounts are added manually. In order to use the CSV Account Upload feature in CloudCheckr, you must create AWS credentials using the IAM access key and secret key in the AWS Management Console. Perform the steps in the procedure, Creating AWS Credentials Using IAM Access Keys, which shows you how to create a user and export a .CSV file that contains their IAM access key and secret key. To add multiple accounts and credentials in bulk, you must provide a .CSV file that contains a complete list of the users and their associated accounts, IAM access keys, and secret keys. For each user, copy the IAM access key, secret key, and account name from the separate .CSV files you exported earlier and paste them into one .CSV file. To download a template, click CSV-Template.csv. Incorrect formatting or empty fields may cause the upload to fail. In this case, the application does not provide an error message. To ensure your upload is successful, remove column headers before you upload the file. Save the .CSV file that contains all of your IAM access keys, secret keys, and account names on your PC. From the header bar, click the Admin Functions icon and select CSV Account Upload from the menu. The CSV Upload dialog box opens. Click Choose File to navigate to the .CSV file that contains the list of accounts you want to configure. All accounts listed in the .CSV file now contain credentials. From the landing page, select the payer account. 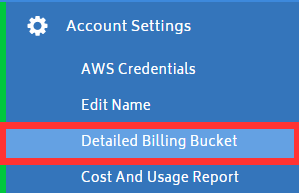 From the left navigation pane, choose Account Settings > Detailed Billing Bucket. The Edit Detailed Billing Bucket screen opens. Select the Register AWS accounts for new payees check box and click Update. Once the bill collector runs (it runs once every hour), the application will create a separate project for each linked account in the consolidated billing family. Once the accounts are in the application, you can add credentials manually using the CloudFormation templates in the AWS Management Console.